Candelario Orlando López Vergara (February 2, 1933 – February 9, 2009), better known as Cachaíto, was a Cuban bassist and composer, who gained international fame after his involvement in the Buena Vista Social Club recordings. He was nicknamed Cachaíto ("little Cachao") after his uncle, the famous bassist and innovator of mambo music Israel "Cachao" López. His father and Cachao's older brother was Orestes López, also a famous bassist/multi-instrumentalist and composer. Born in Havana on February 2, 1933, Orlando "Cachaíto" López first got actively involved in music when he was only nine years old. By the age of eleven he was involved with an orchestra with his aunt. His early desire was to play the violin, but his grandfather Pedro insisted he take up the double bass, as there had been a long tradition of bassists in the López family - legend has it that there are over 30 bassists in its lineage; a trend that they did not want stopped. He started learning the double bass on a cello, quickly moving onto a double bass when he was large enough. His musical career is said to have started when he was twelve, and at the age of 13, Cachaíto composed his first piece, a danzón called Isora Infantil. By the time he was 17 he replaced his uncle as the bassist with Antonio Arcaño y Sus Maravillas, a band that had been around since before Cachaíto was born. He made such an impression on the group that he was asked to stay. In the 1950s, he helped create the descarga style of music that is a mix between jazz-styled improvisation with Afro-Cuban rhythms, and by 1957 he was playing with the hugely popular Havana dance band, Orquesta Riverside. In the 1960s, he became a bassist with the National Symphony Orchestra  and he took classes with the Czech bassist Karel Kopriva. 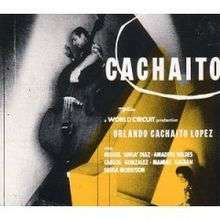 Cachaíto also collaborated with renowned pianists Peruchín, Frank Emilio Flynn and Chucho Valdés, as well as percussionists Tata Güines and Angá Díaz. Cachaíto died in a hospital in Havana on February 9, 2009, after complications from pancreatic cancer surgery. He was 76. ↑ "Orlando 'Cachaíto' Lopez". The Guardian. 11 February 2009. Retrieved 18 December 2012.